In celebration of Women’s History Month and International Women’s Day, this is the fourth in a series of installments from Smithsonian Institution Archives staff highlighting women in science photographs. We will post portraits of women science here throughout the month. 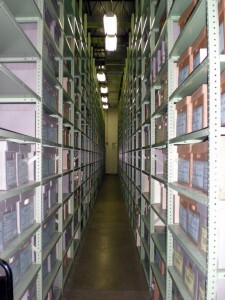 In 1990, the Smithsonian Institution Archives (SIA) acquired part of the Science Service morgue file (SIA Accession 90-105). This collection contains biographical information, images, and subject files on scientific topics ranging from atomic energy to vitamins. During the first fourteen years we had custody of Accession 90-105, it didn't get much play, and that's not surprising, because there was no information out there advertising it. In recent years, however, it has become increasingly popular and a "go-to" collection for finding images of scientists. When I started at the Archives, I was on the team that brought in all new accessions and maintained Archives collections. One of our "other duties as assigned" was to go to our off-site storage facility to retrieve boxes requested by researchers. It's funny how one learns where certain collections live without looking up a location, even in a warehouse that stored over 12,000 boxes. We all knew where 90-105 was, 1) because it was large (68 cubic feet) and 2) because we started getting requests for 2-3 boxes a month. When one of these requests came in, the first question was not, "Where is it?" but "How high will we have to climb?" Sometimes the boxes were on the highest of 12 shelves. Roll out the ladder! The most popular part of this morgue is the biographical section. Because of this popularity, we started digitizing the thousands of images contained in 90-105. To date, we have scanned over 5,400 photographs (about one half of the images). As one of our intern scanners said, many of the portraits are of "dead white guys," but there are also a good number of women scientists represented in the collection. We are showcasing just a few of those this month. However, there's still work to do after digitization. For many images (some are posted here) there are no captions or other information indicating exactly who these people were. This week we are posting several photographs for which we have no description other than the woman's name (and sometimes only the husband's name). We invite you to contribute your research to our project.